This vest is made from genuine leather with full punch buttons and closure, six cargo pockets with side tagged zipped and punch buttons. 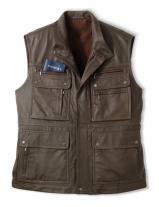 Chocolate brown colored vest with pure nylon coating at the out and lined with dual coating brown polyester. 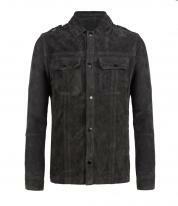 Suitable for travel where you can have all your needs in the cargo pockets. 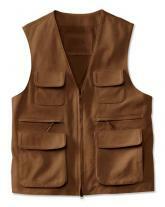 Ample length and width for excellent fit, closed collared neck with buttons. 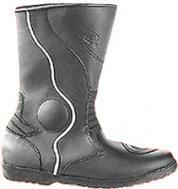 Bound embroidered edges for heavy duty and long lasting use. 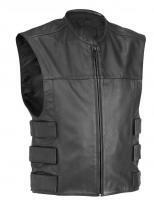 This vest is made from pure cow leather and makes you look elegant .